Our mission is to provide for you, our clients a unique and personalised salon experience. We endeavour to listen, create and bring to life your vision of the perfect hairstyle whilst offering professional advice according to your hair type, face shape and lifestyle, thus creating a harmonious fusion of understanding, skill and relaxation in our eco-friendly and sustainable salon. Infinity Hair Design stylists attend the highest quality education and training consistently throughout the year, which ensures we are always abreast of the changing fashion. Whether it’s a simple trim, haircut, hair extensions, complex colour work or a full consultation to help you come up with a totally new look, our professional team is here to help you. We pride ourselves on being an ethically sustainable, environmentally friendly, natural organic De Lorenzo ASPYA salon. De Lorenzo’s mission is to provide professional salons with the best quality, natural based hair care, manufactured in an environmentally responsible way. They use certified organic ingredients that are sustainably farmed and wild-harvested wherever possible and are strongly opposed to animal testing, all of which is in line with our mission – Embracing the Nature of Hair. We also provide a range of 100% pure certified organic shampoos, conditioners and hair colours from DNA. Their colours are free from Ammonia, PPD and Resorcinol and contain 33 certified organic ingredients. They have been researched and Developed in Australia by Australian hairdressers and created using Organic Compound ingredients as the basis for the formula in every tube, lessening your toxic load. 95% of our waste gets recycled! That means your hair we cut will either go to make hair booms to help clean up oil spills or a charitable wig making service, the proceeds your foil will gain from recycling will go to Oz Harest , left over chemicals from hair colour will be recycled into new liquids and that’s only some of what we will be achieving! Unfortunately, aluminium doesn’t degrade easily, it actually contaminates the soil for 500 years. Add to this the waste of plastics, colour tubes, cut hair and more, and you soon see that beauty at any price is no longer an option. After joining Sustainable Salons Australia (SSA), We at Infinity are set to change all this. Rather than contaminating the waterways, excess shampoo and hair colour waste now go to a chemical recycler. Plastics are also recycled into construction material and gardening equipment. What’s more, Infinity staff love that the proceeds from recycling benefit the community through several programs. Every kilo of recycled aluminium helps Oz Harvest fund four meals for the homeless. Ponytails go to the Variety Charity to provide wigs to children with alopecia, while cut hair is made into booms used to absorb oil spills. By joining Sustainable Salons Australia, Infinity is happy it can support charities and benefit the community, while also taking care of a huge waste problem. We are Australian Hairdressing Council Members with a GOLD Salon Select Accreditation. Wouldn’t you like to know that your salon is ethically sound and meets the national standards of service and quality? The Australian Hairdressing Council (AHC) is the Australian Wide Hairdressing Industry Association, that sets standards for salons and represents the professional hairdressing industry nationally. Enjoy the peace of mind knowing that you will receive high-quality salon services within clean and hygienic conditions, professional stylists and staff who can understand just what you need. Salon Select members have met these standards and will provide you with the salon that you would expect in terms of service and result. When you see AHC accreditation you receive quality hairdressing! Kristy commenced her career in 1995. She graduated Tafe with credits and distinctions and came first in the science of hair. With an analytical and creative mind she joined Heidi in 2004 and together they have built a successful business. Kristy’s adventurous nature has seen her travel extensively learning many hairdressing techniques from an award-winning salon she worked at in London. Specialising in modern and vintage up-styles for formals and bridal parties, colour and short hairstyles she loves the creative outlet hairdressing gives her. Heidi began her career back in 1992, winning numerous awards including apprentice of the year twice, Wella stylist of the year and came first at Tafe in science which paved the way for her interest in trichology – the scientific study of the health of hair and scalp. Heidi bought the salon in 2002 and built it from humble beginnings to the successful business it is today. 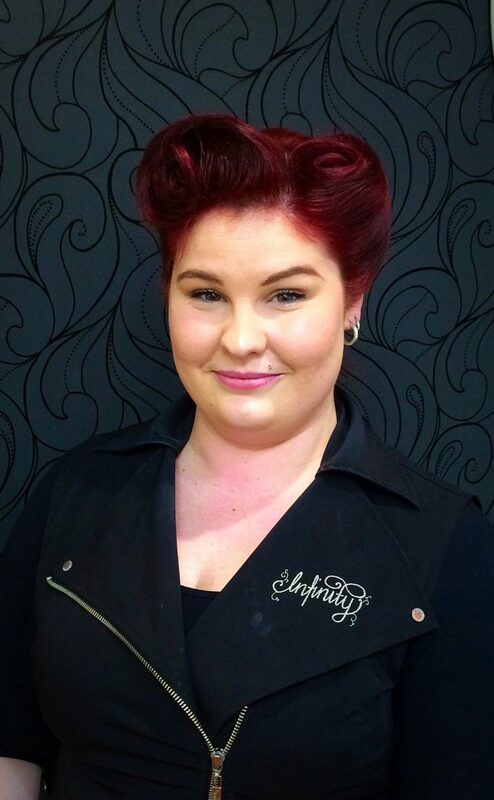 She specialises in colour and enjoys experimenting with new formulas to challenge her creative mind. Selena commenced her career in 1986. Since then she has gained a very loyal clientele, some who have been with her since she started hairdressing in Berowra in 1991. We were lucky enough for Selena to join our team 10 years ago. Within that time she has gone from strength to strength in gaining knowledge through numerous courses in cutting and colouring techniques, excelling in short hairstyles. Stacey is now a fully qualified hairdresser! We have trained Stacey to cut, colour and style the ‘Infinity’ way so you can be rest assured that she is highly skilled and specialises in creative colour work. With her fashion-forward approach and a lot of courses under her belt that she finished ‘top of her class’ in she is already gaining a loyal clientele. ‘I love hairdressing because every client’s style is different which keeps you on your toes and never gets boring. Shauna is now a senior stylist! Shauna started with us in 2015 and has done all her training with us. Shauna is an amazing hairdresser with specialised skills in balayage and Keratin straightening. Shauna loves hairdressing because it’s creative, never boring and there’s always something different happening. Our apprentice Meg started with us in 2017. Meg has a bubbly nature and a natural creativeness that will no doubt show through in her future work as a hairdresser. Meg is very caring to the needs of clients and always on top of making them feel comfortable and welcome in the salon. We’re looking forward to seeing her blossom and achieve her goal of becoming a master hairdresser. Our apprentice Emma has a natural flair for hairdressing and is acquiring techniques quickly and easily. She is a master at basin skills and if you’re lucky enough to get her she will give you a scalp massage that you wont forget! Emma is going to be a fantastic hairdresser…. Watch this space!